Hibernian have been drawn to face Falkirk in the semi-finals of the Scottish Cup. 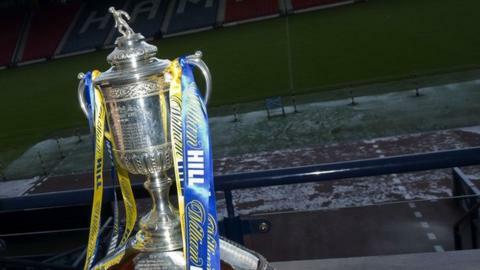 Dundee United will take on SPL opponents Celtic with a place in the final at Hampden in May at stake. Falkirk, the only First Division outfit remaining in the competition, will aim to beat last season's finalists. Reacting to the draw, Celtic captain Scott Brown tweeted: "So Dundee Utd in cup, be a hard game as they have started to hit some form but I have faith in our lads." And Brown's team-mate Mikael Lustig told BBC Scotland: "We want to win the trophy this year. Dundee United are a really good team. "They have some young lads in the team and we'll have to be at our best if we want to reach the final." Dundee United chairman Stephen Thompson said he was "delighted" to be in the draw, following their 2-1 win over the Dark Blues at Dens Park. And he added: "Celtic is a hard game but any game would have been difficult and you just take what you get in the draw. "Celtic are a very difficult team [to beat] but it's a one-off game so you never know. "If we hit form on the day I'm sure we are capable of beating them." Hibernian captain James McPake revealed that, while he is not under-estimating the challenge posed by the Bairns, the Easter Road side will be motivated by a desire to make up for their 5-1 mauling by Hearts in last season's Scottish Cup final. "On paper it's the best draw we could have got but I'm still a wee bit wary of it," he told BBC Scotland. "Being a First Division team doesn't mean anything. Coming into a cup tie it's win or bust so for both of us it's going to be a tough tie. "We are happy just to be here and be in the draw. "It [the cup final defeat] was a terrible day last season. It's hurting a lot of people still. We've gone too long not winning this cup. "We have the chance to make amends." Falkirk were represented at the draw by their technical director Alex Smith. He described the idea of returning to Hampden for a cup final as "an absolute dream" and is looking to the tie against Hibs as a learning experience for the squad. "It's really thrilling for everybody. It will be a great day for the young players," he said. "The build-up to the game will be very exciting for them. "Our club is about progress with the young players and for them to gain experience to take Falkirk into the top flight. "For us this is great preparation for that, although this particular tie gives us an opportunity to go into the final. "The supporters have stuck by us brilliantly this last while. They have followed the structure in the club to develop our own young players. "That's quite a long journey and there are a lot of frustrations on the journey. To bring them here to play in a cup final would be an absolute dream."